The Ubiquitous Sandbag. The basic building block in flood control. The traditional sandbag is made of burlap. It measures 14" wide by 24" long. A properly filled sandbag, just over half full, weights approximately 42 pounds, avoirdupois. The proper method for filling a sandbag requires two people. One person holds the bag open. The second person uses a Number 2 round nose shovel, to fill the bag just over one half full. If the sandbag is to be transported, it needs to be tied just below the top. A capable "team" can fill approximately 20 sandbags per hour. 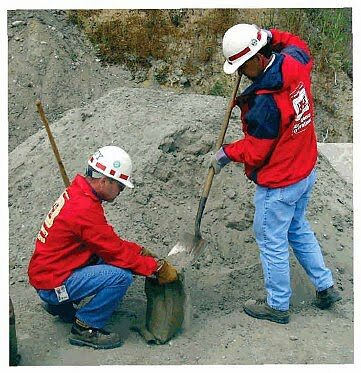 While labor intensive and awkwardly slow, sandbagging can protect lives and property. And every year since "Day One," somewhere, sandbagging is taking place to repel floodwaters. 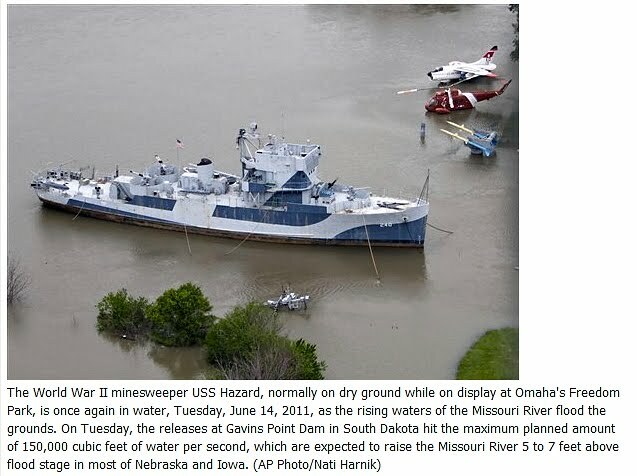 Today, Omaha Nebraska sent a call to her residents, asking for help to get more than 250,000 sandbags filled fast, even though right now it is not sure where they may be needed. What can be accomplished with 250,000 sandbags? Well, not that much. Remembering our early estimate that a two-person team can fill 20 bags per hour, this team, excluding "personal breaks" will labor 12,500 hours to fill 250,000 bags! When you recall there are 8,765 hours in a year, there is a problem filling those bags next weekend! There are two ways to increase bag output. A recent 'Sunday Sandbag Thrown-Down' in Bismarck, North Dakota, brought out an estimated 700 residents. In a six-hour sprint, they produced about 300,000 sandbags! 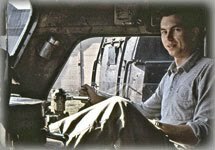 In addition to the traditional two-person teams, a host of devices were employed to increase the hourly output of sandbags. One device uses frames holding multiple bags. But the one device that dramatically increased bag output in Bismarck, was the Sandbag Spider. A conveyor belt supplies sand to a central holding tank, with twelve discharge tubes distributing sand loaders. One person holds the bag at the discharge; the second person ties off the bag and loads it on a pallet. The original "spider" - "The Sandbagger" - was invented in Canada in 1991. Bergeron's creation was added to Manitoba's flood-fighting arsenal in 1997, and has helped keep Fargo North Dakota residents high and dry from the surge of floodwater so far this year. The Sandbagger can fill 12 sandbags in just 7.5 seconds, making the backbreaking labor a lot more efficient, and fun for volunteers. Sand travels up a conveyor belt and gets dumped into the machine's funnel, that distributes the sand to 12 separate chutes. Volunteers armed with empty sandbags must be ready for the quick dump of sand, and speedily pass it off down an assembly line consisting of bag tiers, bag passers and bag tossers. The machine is the brainchild of Elie resident Guy Bergeron, a former gravel pit operator who vowed to invent a quick way to sandbag after his St. Eustache home was threatened by floodwater in the mid-1970s. 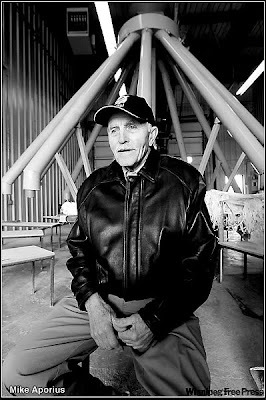 Bergeron's creation was added to Manitoba's flood-fighting arsenal n 1997, and helped keep Fargo North Dakota residents high and dry from the surge of floodwater so far this year. At Fargo they said there's no way they would have been able to hold the river back without it,' said Bergeron, standing near his invention at the St. Andrews Fire Hall. "Even here, I'm told with the flood threat they wouldn't be able to keep up without it." It takes a team of 60 volunteers to operate the Sandbagger smoothly, and the device can fill up to 5,000 sandbags an hour if it's running at full speed. Two person team - 20 bags per hour. One Sandbagger Machine - 5,000 bags per hour. That is only part of the sandbag story. 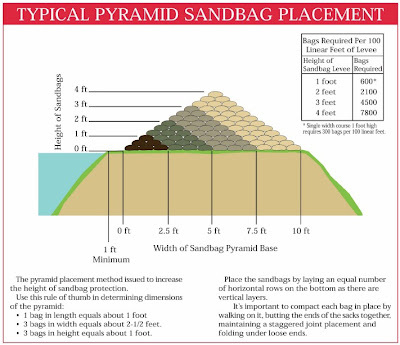 How do you know how much sand to supply to the sand bagging site. Each 14" x 24" bag will hold 0.4 cubic feet of sand. Each yard of sand will fill 67 bags half full. 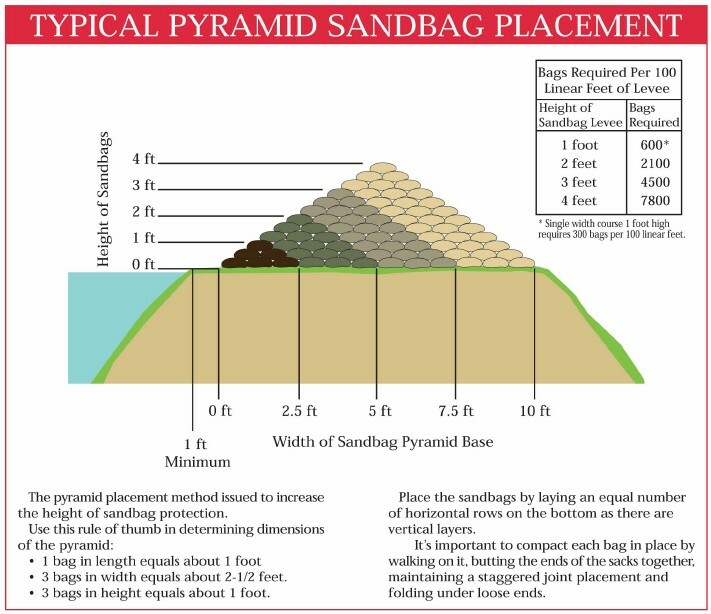 For sandbagging operations, the amount of sand, as well as proper bag placement, is found here. Following the flood event, disposing of sandbags presents its own set of problems, as we have become increasingly aware of waterborne pathogens. Rapid Current: The National Weather Service states that simply six inches of fast-moving water can knock you off your feet. Two feet of fast-moving water will sweep a motor vehicle away. Debris: Rushing flood waters pick up everything: tree branches, lumber, furniture, and propane tanks, even houses. These heavy items develop incredible force when pushed by rapidly moving water. Colliding with this type of heavy debris can cause serious injuries or death. Chemicals: Flood waters and may contain any variety of contaminants including, fertilizer, and pesticides, industrial chemicals, toxic wastes, paint, oil, fuel, gasoline, human and animal waste. Think of everything you store under your kitchen sink or garage! Shock hazards: Floodwater may be energized with electricity from underground or downed power lines. Wading in water around buildings where the electricity is still on can lead to electrocution. Infectious organisms: Floodwater can pick up pathogens from surface runoff and partially treated sewage, since wastewater treatments systems are often in low-lying areas prone to flooding. Floodwater may contain E. Coli, Salmonella, Shigella, Hepatitis A Virus, and Typhoid. Such illnesses can cause a variety of symptoms including skin, ear, respiratory, eye, wound infections, and diarrhea. 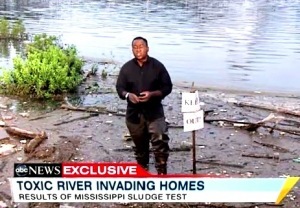 Finally, standing floodwater provides habitat for mosquitoes which can breed and spread disease. Remember these issues the next time you see a dim-witted weatherman or journalist slogging around in this toxic soup. 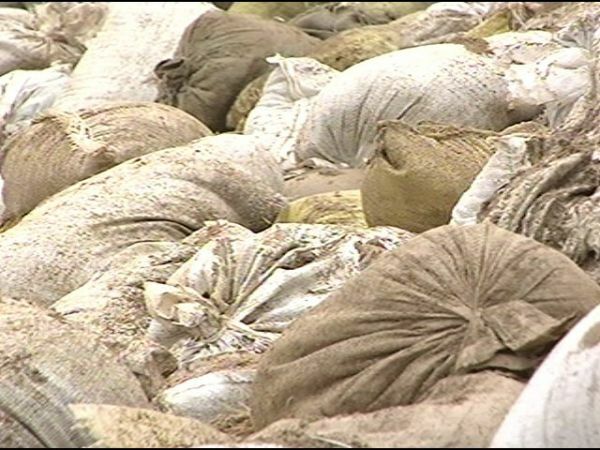 The Mississippi Department of Environmental Quality issued specific guidelines for proper disposal or reuse of sandbags used during severe storms and flooding. Similar guidelines are published by most states. What an irony. The sandbag used for protecting lives and property becomes a biological hazardous disposal problem! Next: Tiger Dams: The Sandbag Alternative. Fascinating article - really enjoyed it. Who knew there was so much to be said about a humble sandbag! Missouri River: A Two-Lane Freeway! 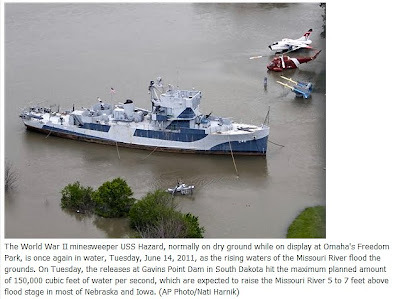 Missouri River: The Second Coming!